Portable Bluetooth wireless isolating ear-insert sports earphones that come with four pairs of ear pieces in various sizes, three pairs of earbowl support of various sizes, a USB charging cable, four connecting cable shortening clips, a carrying case, and free Jabra Sport Life and Jabra Sound app downloads for Apple or Android mobile devices. 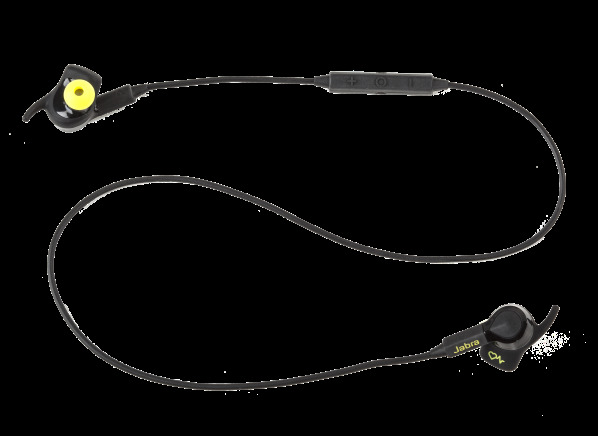 The Jabra Sport Pulse Wireless portable Bluetooth wireless sports earphones have an isolating ear-insert design. These earphones are intended for use with Bluetooth enabled audio devices including cell phones and have a claimed reception range of around 33 feet. They have an integrated microphone and volume, music player function, and call connect/disconnect controls. Additional features include a built-in heart rate monitor function (which requires the free Jabra Sport Life app or other compatible app in order to view heart rate on a Bluetooth connected mobile device), NFC Bluetooth pairing, and manufacturer claimed weather and shock resistance. The Sport Pulse Wireless comes with four pairs of ear pieces in various sizes, three pairs of earbowl support of various sizes, a USB charging cable, and a carrying case; free Jabra Sport Life and Jabra Sound app downloads for Apple or Android mobile devices are also available. It is covered by a 12-month warranty. Plug type Plug type The type of connection at the end of the audio cord, which will be plugged into the source component. Most have 1/8-inch standard (3-contact) "mini" jacks that fit portable devices. Models intended for use with newer iPod, iPhone, and some Blackberry smartphones, that have integrated microphones, audio player controls, and call connect/disconnect controls use a 1/8-inch 4-conductor mini jack. The audio function of models with 4-conductor mini jacks may not work properly or consistently with non-iPod/iPhone devices. Integrated microphone Integrated microphone Has an integrated microphone for use with some cell phones or audio players with a recorder function. Call connect/disconnect control Call connect/disconnect control This allows you to answer or disconnect from a phone call with some cell phones. Integrated volume control Integrated volume control This allows you to adjust the volume without having to dig into your pocket or purse for a player. Integrated function control Integrated function control This allows you to control some player functions (for example: play, pause, track skip) via a control without having to dig into a pocket or purse for a player. Warranty: parts, labor (mos.) Warranty: parts, labor Warranty (parts/labor, mo.) indicates the length of the manufacturer's warranty for parts and labor, in months. Additional features Additional features Additional features for this model. Has built-in heart rate monitor function (requires free Jabra Sport Life app or other compatible app to view heart rate on connected mobile device). Has Dolby sound feature when used with the free Jabra Sound app. Manufacturer claims weather and shock resistance. 2.4 GHz transmission frequency, Bluetooth wireless, around 33 ft. operating range. Optional NFC Bluetooth pairing. Operates up to 5 hrs. on built-in rechargeable batteries with a charge time of 2.5 hrs. Has headset auto power off function, and battery recharge indicator. Allows simultaneous connection of two Bluetooth devices. Has pairing memory for up to 8 Bluetooth devices. Has power on/off tones, Bluetooth pairing and battery status voice announcements. Supports voice activated dialing when used with Bluetooth capable cell phones that have that feature. Bluetooth connected Apple mobile devices using iOS Version 5 and above will show the battery level. Included accessories Included accessories Indicates what additional accessories are included. Four pairs of ear pieces in various sizes, three pairs of earbowl support of various sizes, USB charging cable, four connecting cable shorting clips, carrying case, free Jabra Sport Life and Jabra Sound app downloads for iOS or Android mobile devices. Cord length (in.) Cord length Cord lengths indicates the approximate length of the cord from the headset or earpiece to the plug, measured in inches. Weight (oz.) Weight Reflects the weight, in ounces, of the headphones including the audio cable and batteries, if any.